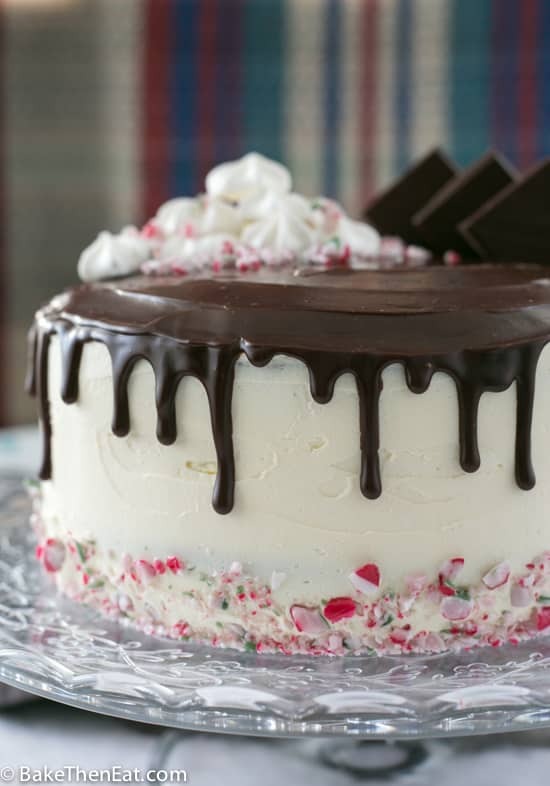 This Rich Easy Chocolate Peppermint Drip Cake came about from a few different conversations. First of and most importantly, it’s my birthday today. So happy birthday to me 😀 and this is my birthday present to myself. Secondly, it also came about from a conversation with a friend about the stress of baking for the festive season. Is there a way to make it easier and take the pressure off? Well, there is, so read on to find out what conclusions we came to. After this conversation about making festive baking easier, I had a bit of a think on how to do this. One of my favourite recipes from last Christmas Easy Chocolate Chip Cookie Snickers Cheesecake Bars were made with ready-made chocolate chip cookie dough. These bars were so quick and easy to make. So that got me to thinking why not use shortcuts to their full advantage. Now I am the first person to scream and shout about making everything from scratch. But sometimes time just does not allow for us to be all virtuous about such things. I am a busy woman, I work full time and I’m also studying a degree part-time oh and I run this blog. I’m exhausted just typing all this! So thinking of my friend, who also has kids I decided that I was going to make a few treats this festive season all coming from cake box mixes. I wanted to make them taste better than normal, let’s be honest cake mixes made the suggested way are a little bland and no real deep flavour to them. 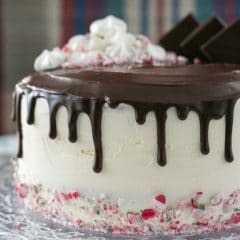 This Chocolate Peppermint Drip Cake will prove with just a few tweaks box mixes can actually be pretty good! Adding in a few things. First off I started with a chocolate devil foods cake box mix. The box just calls for oil, water and eggs, this was just not going to cut it though. I needed to add flavour and texture to make the overall cake taste better. Instead, I used a combination of oil, melted butter, sour cream, milk and strong black coffee. Don’t worry if you are not a coffee fan, it just helps to bring out the chocolate flavour. I used the suggested number of eggs, 3 and I added 2 teaspoons of peppermint extract. Now to save time you can keep the decorating as simple as you like. You could just simply make the buttercream and place half of in between the two sponges and the rest on top. 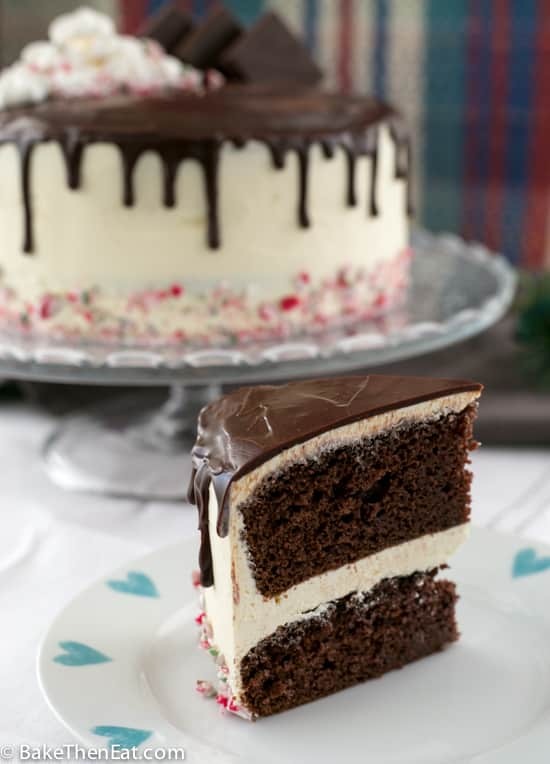 This will give you a lovely minty chocolaty creamy cake, perfect for almost any occasion. This helps with the quick aspect of the cake. If you want to recreate what I did then it will take a little longer. I fancied it up as it was my own birthday cake. And you need pretty cakes for a blog! I used half of the buttercream to fill the cake, and I used half to cover it. As I mentioned this will be a little more time-consuming, as you will first need to do a crumb coating. Which is covering the cake with a thin layer of the frosting then allowing it to sit in the fridge for at least an hour. Once the cake is nice and cold you will need to cover the cake with the rest of the frosting. For a really good detailed guide of crumb coating please read this article by Craftsy.com ‘A No-Nonsense Guide for How to Crumb Coat a Cake‘ its the one I used. The cake needs to go back into the fridge for at least another hour. The cake needs to be nice and cold. Chocolate ganache is actually easy to make. All you need is chocolate, a touch of glucose or light corn syrup and double/heavy cream. Everything goes into the microwave for about 30-45 seconds. Then allow it to sit for about 30 seconds before stirring it gently until all of the chocolate is melted. Should you have any trouble getting the chocolate to melt pop it back into the microwave for 10 seconds. Then either place the ganache in the fridge for 15 minutes or allow it to sit at room temperature for around 30 minutes. I used Lindt Dark Mint Chocolate for an extra little minty kick for my ganache but just plain dark chocolate will do if you don’t want a mint flavour to your ganache. But if possible use a bar of good chocolate for your ganache as it will greatly improve the flavour. I watched a ton of YouTube videos on how to make the perfect drip as this was my first time. I decided to go with the little squeezy plastic bottle method. But I think a piping bag or even a spoon would work perfectly. So head to YouTube and choose your favourite method. Once you have gone around the edge of your cake creating the drip effect gently pour the remaining ganache onto the top of the cake and gently smooth it out. Be careful, you may not need all of the ganache and you don’t want to flood the cake. I had a few tablespoons spare at the end. Then feel free to go crazy with your decorations, I used a few crushed candy canes for the bottom of the cake. I used a few spare squares of the mint chocolate that I had left over and a few mini meringues I had in the cupboard. Finished off with a few remaining sprinkles of crushed candy cane. But use as little or as much as you want for the decoration. It is all completely optional. 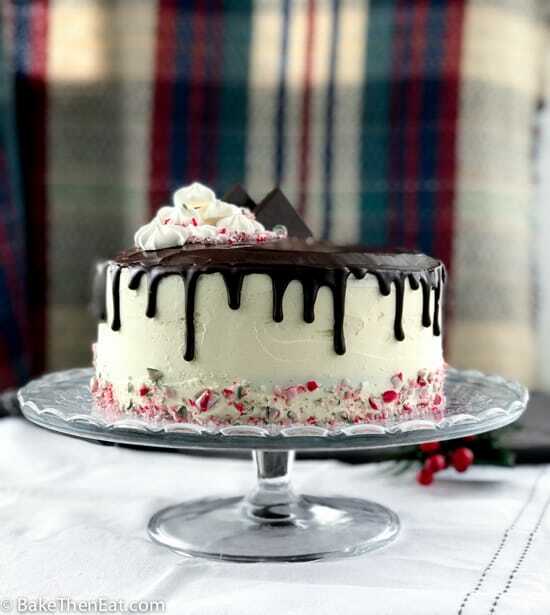 A Chocolate Peppermint Drip Cake made with a box mix for speed and ease. Perfect for a festive celebration. Preheat your oven to 180C/350F/Gas mark 4 and lightly grease and line two 8 inch/20 cm round cake tins with baking parchment and place to one side. In a large mixing bowl add in the cake mix along with all the other ingredients for the cake, and then gently mix it all together. Equally, divide the batter between the two cake tins and bake them in the centre of your oven for 25 minutes. 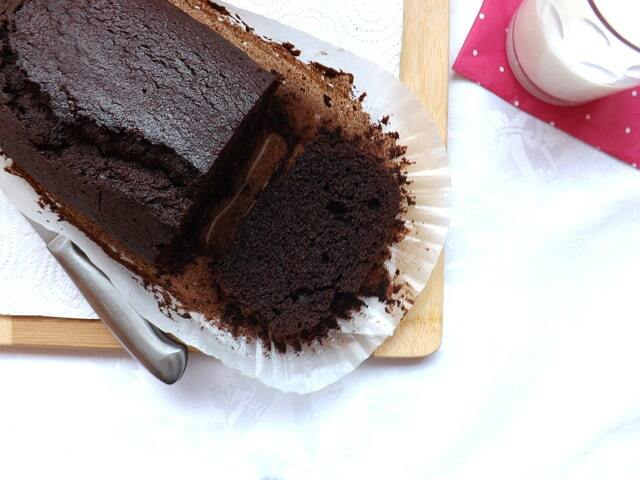 Test the doneness of the cake with a pick, if it comes out clean then your cake is baked. Take the tins out of the oven and after a few minutes transfer the cakes to a wire rack to fully cool down. To speed the cooling up pop the cakes in the fridge or freezer. While the cake is baking, make your frosting so everything is ready to go as soon as your cake is cool. Beat the butter in a stand mixer with the paddle attachment for 8 minutes. Or an electric hand mixer for 10 minutes. You are looking for your butter to be pale and creamy. Add in half of the icing sugar and mix again until it is fully incorporated. Mix in the remaining icing sugar. Don't worry if it looks a little dry at this point. Pour in the double cream. First, start with 3 tablespoons if you still feel it needs a little more loosening then add in the remaining tablespoon. Now add the peppermint extract. Please be careful when adding the extract it will only take a drop to go from minty fresh to toothpaste! Start with 1/2 teaspoon, mix it in really well then taste your frosting. I found 3/4 teaspoon was the perfect taste for me, but keep tasting. Add only a tiny drop at a time. Once the frosting is done place to one side until your cakes are cold. 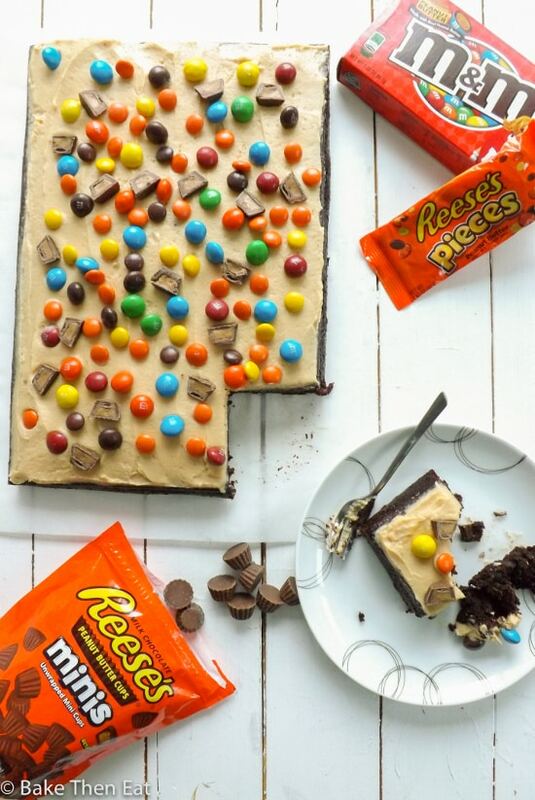 Use half of the frosting to sandwich the two cakes together. Then take a small amount of the frosting and cover the whole of the cake in a thin layer of it. Try and smooth it out as much as you can. Place the cake back into the fridge for at least an hour or freezer for 25 minutes, you need your cake to be as cold as possible before adding the final coat of frosting. Once the cake is cold carefully cover the whole cake with the remaining amount of frosting. Smooth it out as best you can. There are plenty of fancy tools on the market to help you with this I just used a flat edge spatula. Place the cake back in the fridge for at least another hour or the freezer for 25 minutes. Break the chocolate up into small pieces and place them into a microwavable bowl. Add in the glucose and the cream. Gently heat in the microwave, start with 30 seconds if the cream is all steamy then it is warm enough. If it's not steaming heat again at 10-second increments. Then leave the warm cream and chocolate to sit for 30 seconds. The gently stir until it all comes together. The ganache needs to cool a little before you apply it to your cake. Either speed it up and place it in the fridge for 15 minutes or leave it at room temperature for about 45 minutes. Once everything it at the right temperature, do a little test drip on the cake. If it doesn't melt the frosting and stops about halfway down, you are good to go. I used a squeezy plastic bottle to apply my ganache, but a piping bag or spoon will also do the job. Carefully go around the edge of the cake applying the ganache. Use slightly different pressure while squeezing you bottle or bag to create different length drips. If using a spoon use a little more or less ganache on your spoon to create your drips. Once you have finished doing the edge of the cake pour most of the remaining ganache into the middle of your cake and very gently smooth it out to completely cover the top. Use the remaining ganache to cover any remaining spots. 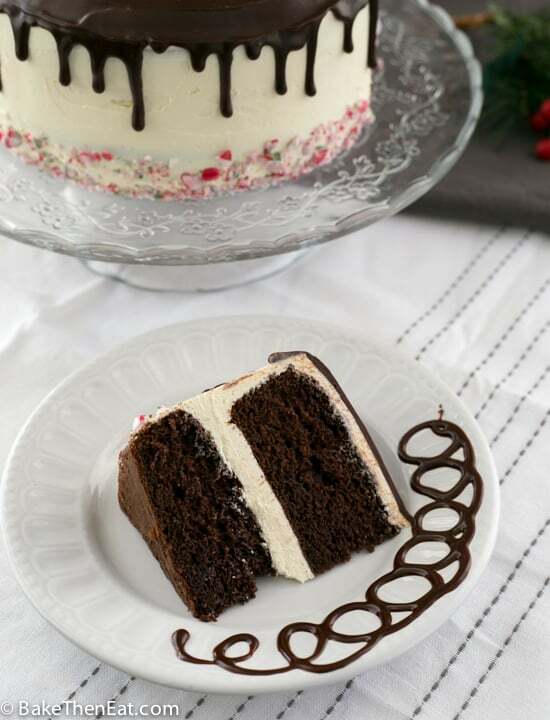 Crush your candy canes and gently place most of the crumbs in a ring around the bottom of your cake. 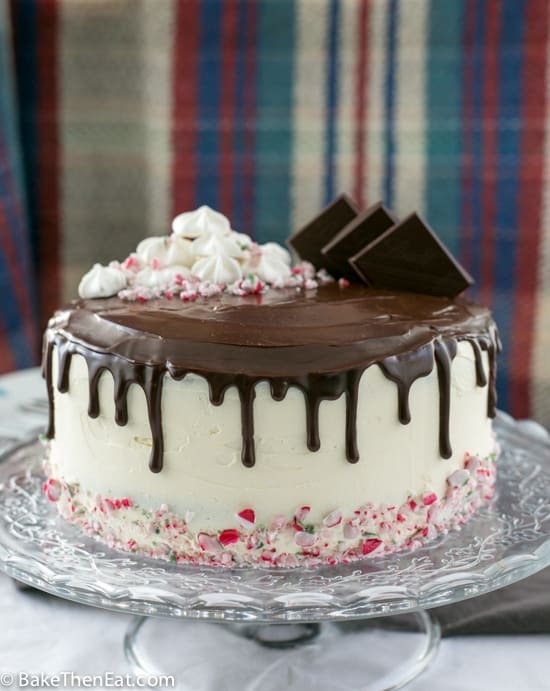 Add the chocolate squares to the top along with the mini meringues and any remaining crushed candy cane fragments. To speed up the cooling time place your cake in the freezer instead of the fridge. Just remember it won't need as long. You want your cake cold, not frozen. It is not necessary to spend so long on decorating this cake, just using the frosting makes a lovely chocolate mint sponge cake. You can always fancy it up with a few festive sprinkles. Thank you, Grace. The consistency is hard to get just right. I found I needed to do lots of testing to get it just right. I think mine was a little too thick, but hey it still tasted good! This cake is SO pretty!! That chocolate ganache…. gets me every time! Happy Birthday! What a great Birthday present – it looks absolutely delicious! I can’t believe you are managing a full-time job, studying for a degree and running this blog. I am very impressed and I very much like the little shortcut in your recipe, very clever! Thank you, Miriam. Life is busy and those shortcuts can be such a time saver! Happy Birthday! And what a lovely treat you’ve baked for yourself — and us! This looks SO good. Decadent, too. Thanks! Happy belated birthday Emma. Oh WOW, this is such a beautiful cake to celebrate with. I am loving everything about it, from the perfect chocolate drip to the beautiful soft texture of the cake. It looks absolutely stunning. Definitely pinning this beauty!!! By the way HAPPY BIRTHDAY to YOU! This cake is absolutely stunning! Love the peppermint chocolate flavor, so good! Perfect holiday bake! We’re totally twins–I have something similar coming up next week but you decorated yours much more beautifully than I did! 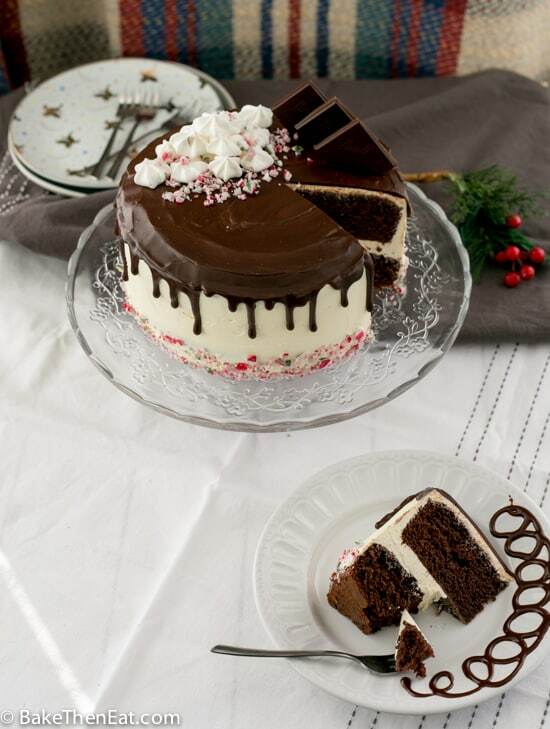 I love the chocolate and peppermint combo this time of year! Thank you, Kelsie. I can’t wait to see your cake as I know it will be beautiful, because your cakes always are. Happy birthday, Emma! What a gorgeous drip cake—hard to believe you’ve never made one before! I’m the same way about cooking/baking—I try to make it all from scratch, but sometimes you just have to take a shortcut or two! Thank you, Liz. From scratch is always best but like you said sometimes shortcuts are just needed. Happy Birthday!! This cake is GORGEOUS and so perfect for this time of year. Can’t imagine a much better way to celebrate a birthday – hope you enjoyed it! Happy birthday! What a wonderful treat you made for yourself! And I truly appreciate your use of a mix, but I might just make it from scratch! With all the bells and whistles, too – I would not want to miss that ganache! Thank you, David. I agree, from scratch is always best and a homemade sponge will be perfect in this cake. Oh goodness Emma! Full time work, studies and a website? Please tell me your are not also attempting this a family with small children too. Please take care of yourself. 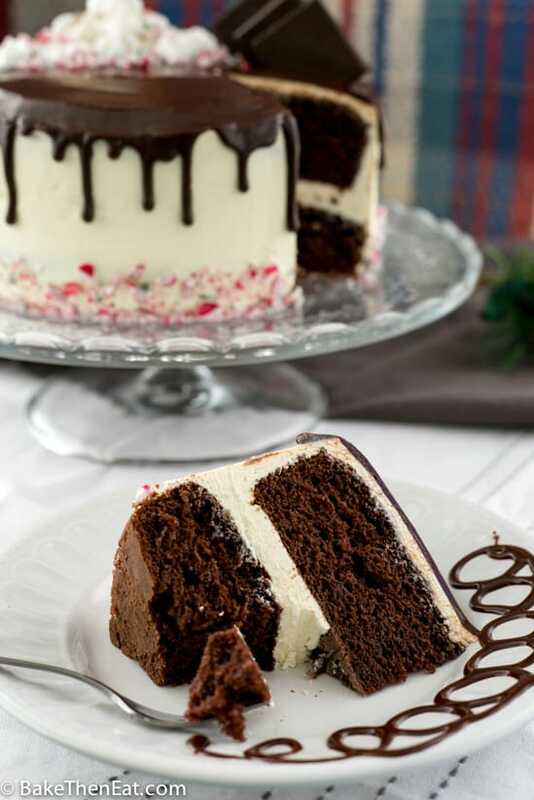 This cake is just what we need to ring in the holidays as chocolate and peppermint is perfect together. Gorgeous! Thank you 🙂 Everyone has grown up and left home, it’s just me and the hubby now. So we do manage to get a little peace and quiet now and again! wow Emma, you have outdone yourself! This is a masterpiece 🙂 and absolutely perfect for the holiday to indulge! Thumbs up for your awesome work!